If you’re visiting Bordeaux, take care to discover the region’s beautiful surroundings: vast vineyards that stretch as far as the horizon, the restless ocean, elegant wine châteaux, and charming medieval villages. Here’s a look at some of the best excursions from Bordeaux. Surrounding the city of Bordeaux, you’ll find a region where both natural and man-made wonders blend in perfect harmony, unveiling themselves in a landscape where colors, fragrances and flavors come together to create a land teeming with delights. From exceptional wines to beautiful landscapes to the relaxing Atlantic beaches, the Bordelais region is just waiting to be discovered! Located less than one hour from Bordeaux, Saint-Émilion boasts everything you could expect and more from a quintessential French Medieval village. Perched on top of a limestone hill overlooking vineyards as far as the eye can see, Saint-Émilion holds UNESCO World Heritage status not just for how it perfectly embodies the region’s rich history, but also because the exceptional landscape is entirely devoted to wine culture. Saint-Émilion is first and foremost about wine, and its vineyards’ reputations are second to none. The geological diversity of local soils – calcareous, argilo-calcareous, sand and gravel – combined with Aquitaine’s temperate maritime climate give the wine its singularity. Set out on a tour to discover Saint-Émilion’s wines through vineyard visits and tastings, and learn to identify the distinct features of this AOC (Controlled Origin Designation). The green, fertile hills outside the village are absolutely captivating. Cycle through the vineyards in the Uplands in search of estates, castles and some more wine to taste. The town itself is well worth a visit. Stroll through these cobbled streets and happen upon a lookout with a breathtaking vista of the astounding scenery. 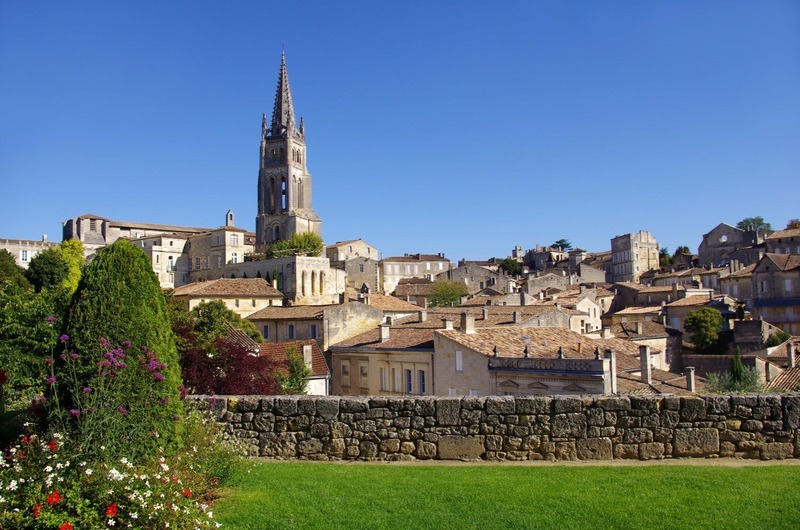 Located on the pilgrimage route to Santiago de Compostela, Saint-Émilion and the surrounding villages are home to many churches, monasteries and beautiful historical monuments. Explore this medieval city and discover the grandeur of its architecture and monuments, marked by the ubiquitous limestone that characterizes both the city and local wine. Once Saint-Émilion has piqued your curiosity – and the local wine has stirred your taste buds – you will most certainly be thirsty for more. From North Bordeaux to Pointe de la Grave, explore the Route des Châteaux (Castles Trail). Take a drive along the famous Départementale 2 route across Le Médoc – a peninsula located between the Atlantic Ocean and the Gironde estuary, home to highly prestigious wines -, this is certainly one of the most beautiful roads in France. Enjoy the spectacle of endless vineyards, pine forests, long sandy beaches, great lakes, and pristine natural sites parading in your rear view mirror. A one-day tour will introduce you to the vocabulary and different stages of a proper wine tasting: Visit the region’s most prestigious châteaux and discuss French gourmet specialties cheeses and charcuterie. Continue your oenological journey and explore the other open estates nearby. Some sites, such as Château du Taillan and its cellars, have been classified as French Historical Monuments, reflecting a contribution to national heritage. To organize the best possible itinerary, visit the first floor of La Cité du Vin in Bordeaux, where you drop by the Vineyard Tour Information Office for details on local wine tourism, such as the different designations and maps. The Route des Châteaux will take you to Margaux, home to the prestigious namesake wine, a Grand Cru Classé enjoyed by Thomas Jefferson, which owes its reputation to a lineage of outstanding vintages. The soul of the vineyard, the estate’s dreamy Palladian style castle, was declared a historic monument in 1946. The Arcachon basin lies along the Silver Coast on the outskirts of the Landes Forest, known for its long sandy beaches bathed in the coolness of the pine trees, the peaceful sound of waves crashing near your feet, and Dune du Pilat – Europe’s highest dune. Located between the ocean and the forest, Dune du Pilat is the only one off the region’s coastal dunes that is moving inland. The rise of this colossal natural monument will provide you with a breathtaking view of the basin and, with a little luck, of the Banc d’Arguin natural reserve. Stroll along the waterfront, climb the dune (you can take the stairs if you’re not feeling adventurous), go for a swim, and enjoy the many water sports and nautical activities on offer. 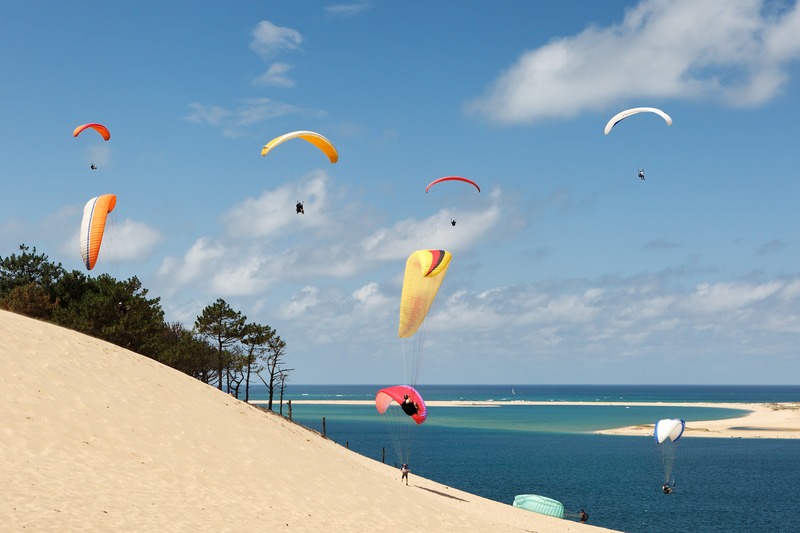 Arcachon is a paradise for paragliders, but you can also partake in yachting, surfing, kite surfing, water skiing, paddle and many other water sports. Set out to the sea and discover the charming Island of Birds (Île aux Oiseaux). Surrounded by oyster beds and known for its huts “on stilts,” this untouched, pristine islet is entirely dependent on daily tides. During the late afternoon take a stroll through the winter town on the hills surrounding Arcachon where you can admire the city’s majestic villas. Commissioned by affluent families, one might think that the houses lining the basin’s shores have been designed as a contest among the power hungry. From Neoclassicism to Gothic to a typical Swiss chalet, these colonial-like villas borrow architectural elements from different styles and eras. Although none are exactly alike, they are all beautifully colored and typical of this landmark resort. After a busy day, you’ll probably want to relax by the ocean, savor some seafood and sip a refreshing beverage…in the form of local wine, perhaps? Stop by one of the many oyster huts located by the basin for a tasty snack and enjoy them with your feet in the sand or even in the water. Shining like a gem suspended in time, the Cap Ferret headland is another perfect holiday location complete with lovely beaches and superb scenery. Admire the lighthouse and stroll through a maze of narrow streets in L’Herbe fishing village characterized by colorful huts still inhabited by oyster fishermen. Cap Ferret has no less than nine oyster harvesting villages, so you won’t want to miss the opportunity to taste oysters, prawns and whelks straight from the source!